Kerry Caruana, 36, from the Gold Coast, Queensland, said her daughter Eden, almost two, started suffering severe eczema and psoriasis when she was just seven weeks old. 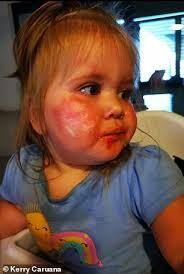 But after applying Glory Oil by Australian brand Eco by Sonya Driver to her daughter's inflamed skin, she couldn't believe how quickly the redness started to disappear. 'Eden had patches on her chest, back and face and her face gets pretty bad. One day her face was so bad that it looked like sunburn,' Ms Caruana told FEMAIL. 'It was extremely red, hot and so sore for her and she kept pointing to her face and saying "owie" - it was so hard seeing her in pain like that and pointing to it all the time while crying.